Do you like cheesy 80’s movies? Specifically, do you like cheesy 80’s movies, like Karate Kid, about people who overcome insurmountable odds to win against the bad guys, usually with the sounds of “Eye of the Tiger” or something similar in the background? If you do, you’ll love this comic. If you don’t, well, this might not be your thing. It’s a fairly simple story. 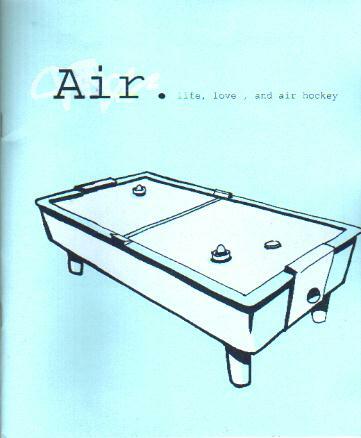 A man named Indy is forced to give up his favorite thing in the world, air hockey, by his girlfriend. Earlier in his life he had watched his Dad lose a tournament and he’s wanted to get even ever since. He meets a girl in a bar who’s a great player and he finds himself getting back into the air hockey world and is talked into entering an air hockey tournament. There’s even a couple of pages that detail his training with the lyrics to “Eye of the Tiger”. You can see where this is going, right? Indy finds himself playing the man who beat his father and, while I’m not going to give away the ending, shame on you if you can’t figure it out. It’s a fun book, that’s true, but if you’re at the point in your life where 80’s movies have lost their nostalgic charm and now they’re just obnoxious, you’re not going to like this book very much. If not, the art’s great, the writing is good (although cheesy, but if you’re going for the 80’s movie theme it’s hard to avoid cheesy), it’s worth a look.And I’m really curious if there are any air hockey tournaments, because I’d love to go to one. Posted on May 2, 2010, in Reviews and tagged Air, Thien Pham. Bookmark the permalink. Comments Off on Pham, Thien – Air.